Inside the museum, you enter a room called the holocaust tower. 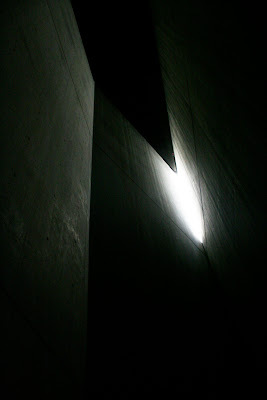 Its a cold and bare concrete chamber, with just a chink of daylight high above. On one wall, a ladder leads to the ceiling, but the bottom of the ladder is about 15 foot in the air. You can hear the traffic going by and the sounds of Berlin outside faintly through the gap at the top of the room. One of the most profound experiences of architecture possible.